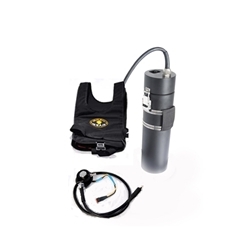 The Q-vest is designed as a modular system consisting of a vest, bulkhead connector block and an external battery canister. This configuration allows diver to wear the vest under the drysuit without additional bulk and dangers associated with internal batteries. A combined inflator/bulkhead connector with universal E/O connector. It comepletely replaces the drysuit valve (see manual for details). There are two sizes of the bulkhead connector 33mm thread diameter fits Scitech inflator valves and 36mm thread diameter fits Apeks/DUI valves. Measure diameter of your valve thread before ordering. Light Monkey battery canister with universal E/O connector. The Q-Vest is powered by 12V 20Ah Li-PO battery providing several hours of comfortable heat output. There is no thermo regulation with this setup. Only on and off switch on the battery can.